Obesity is no longer a symptom and especially morbid obesity is disease and if not tackled will lead to physical, psychological and medical problems. Associated procedures like hysterectomy, hernia repair and other procedures can also be under taken during same sitting in eligible patients. All procedures are done laparoscopically (Key Hole) surgery. Decreased hunger hormone called Ghrelin. Psychological well being and increased physical activity. Weight loss ranges from 50 – 80% of excess weight. Most of the people go back to work in one week. 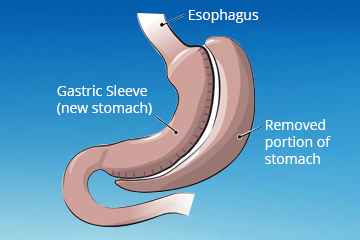 Its restrictive, non reversible procedure where major part of gastric pouch is stapled and excised leaving small banana shaped stomach. It’s simple, safe does not have many long terms problems with good weight loss. 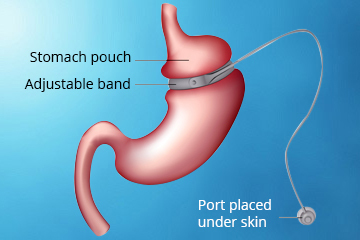 Adjustable gastric band applied around proximal stomach with control reservoir placed under skin which can be used to tighten or loosen band to have control on intake of food. It’s quite safe, reversible. Weight loss is less than sleeve or Bypass. Band can sometimes cause erosion or bleeding which requires its removal. 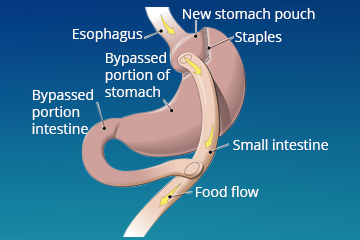 Proximal stomach is stapled to make small pouch of 30cc capacity and small intestine is bypassed by 100 to 150 cm resulting in both restricted calorie intake and malabsorption. Results are good with more weight loss and diabetes control but require more nutritional management. Its standard procedure and can be reversed. Obesity or weight loss surgery not only helps to lose weight, but also to regain confidence of individual in himself or herself. The procedures are much simpler than many assume, and you no longer need to hide yourself and can enjoy life and live life the way you want to live. As you are aware everyone has only one life, no one is sure of next life, make most of your life.